Meaningful activities are of the upmost importance to those living with dementia. Many studies have shown that when a structured activity program is introduced, there is improvement in physical and mental capacity, as well as, improved emotional, behavioral and spiritual demeanor. When you engage someone by individualizing an activity, you offer them a chance to improve their quality of life on many levels. Improved health. Inactivity can lead to general health issues and further immobility. Physical activity does increase cognitive functioning in those with dementia. A structured activity program is a great way to begin a small amount of physical activity. Engaging someone in an activity gives their brain a workout. Studies have shown that engaging someone in a structured activity program can actually slow the progression of dementia. Furthermore, by participating in a meaningful and interesting activity, he or she will often see an improvement in self-esteem. By giving someone a sense of purpose, you give them a reason to feel good about themselves again. Caregivers will benefit from an activity program. Consider this: if your loved one is engaged in an activity they enjoy, they won’t be shadowing you, repeating questions or exhibiting other bad behaviors. It will give you more time to enjoy your loved one and do the things you need to do. An activity program is a great way to begin to reintroduce those living with dementia to a social circle. Isolation can lead to an increased rate of cognitive decline. In fact, in a recent study, researchers found that those experiencing moderate loneliness were twice as likely to be diagnosed with dementia. All too often we see people thrust into a caregiving situation that they may not be prepared for. Introducing a structured activity program will benefit both those living with dementia and their caregivers. To effectively engage someone, the activity must be individualized and appropriate on a cognitive and physical level. Completing an assessment before introducing a new activity program is strongly recommended so you can get an idea of where to start. Engaging the person in a discussion of their likes and dislikes will give you a great idea of how to tailor the activity towards them. Consider things like hobbies, occupations and so on to get a deeper understanding of their past to have the best chance of engagement. 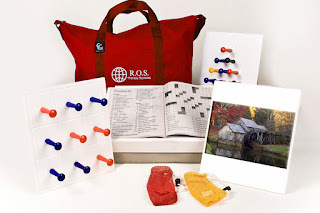 About R.O.S Therapy Systems. R.O.S. Therapy Systems began as a simple backyard project to improve the quality of life of one man in his 25 year fight against Parkinson’s disease and dementia. Over the past several years, R.O.S. has grown into a company with a complete Activities Program of innovative products and training courses that are now used by families, agencies and Long Term Care facilities caring for seniors around the world. Creating solutions where there are needs, R.O.S. will continue to introduce products and services that help all caregivers – Family, Agency and Institutional. R.O.S. Therapy Systems was founded by Scott Silknitter of Greensboro, NC in 2010. Visit www.rostherapysystems.com to learn more.